Home • Architecture • Phra Maha Mondop Phuttabat PhorPorRor. SorKor. 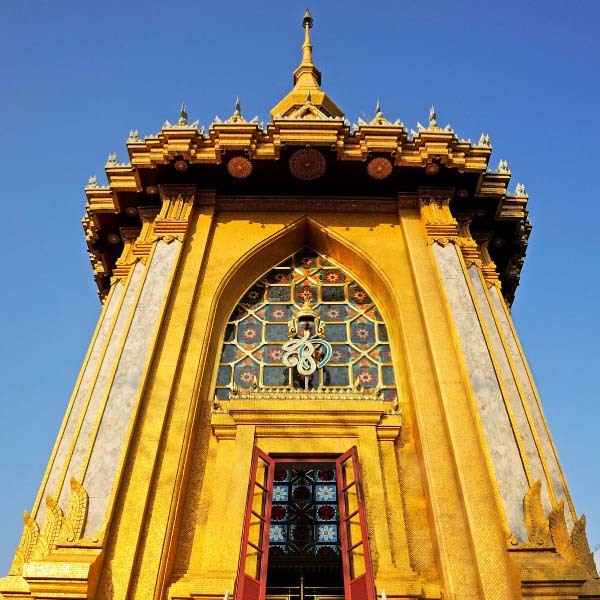 This structure is built on top of Khao Kaew Hill as a homage to His Majesty King Bhumibol Adulyadej and Her Majesty Queen Sirikit. It is 33-meter tall and 9-meter wide across the base. Enshrined inside is a pair of the Lord Buddha’s footprints with the engraved 108 Mongkhol (auspicious) design surrounded by depictions of Phra Asiti, the Eighty Great Disciples of Buddha. His Majesty King Bhumibol Adulyadej presided over the foundation stone laying ceremony of this Maha Mondop on 27 June 1984. The Buddha image in the Leela posture was built in homage to His Majesty King Bhumibol Adulyadej. The Buddha image in the Ramphueng posture was built in homage to Her Majesty Queen Sirikit. The Buddha image in the Prathanphon posture was built in homage to King Taksin the Great. The Buddha image in the Perd Lok posture was built in homage to King Naresuan the Great. All four Buddha images, the Buddha’s footprints and Giant figure designs found at the foot of the staircase leading to the Maha Mondop were the works of Mr. Mod Wongsawad, the 1988 National Artist in visual arts. The golden mosaics. The decorative golden mosaics of the Maha Mondop are those previously used to decorate the Phra Si Rattana Chedi Stupa in the Temple of the Emerald Buddha in Bangkok. During the latter’s 1982 renovation, the old golden mosaics were removed and replaced by imported mosaics from Venice, Italy. The old ones were then used to decorate the Maha Mondop. The staircase leading to Phra Maha Mondop Phuttabat PhorPorRor is decorated with a stucco, three-headed Naga (Great Serpent) on each side. The wavy bodies of the Naga in the form of the balustrades of the staircase were crafted in the Nak Sadueng (shuddering naga) design. The staircase has a total of 200 steps.